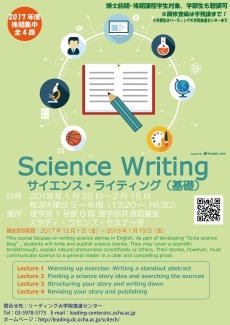 This course focuses on writing science stories in English. As part of developing “Ocha science blog”, students will write and publish science stories. They may cover a scientific breakthrough, explain natural phenomena scientifically or others. Their stories, however, must communicate science to a general reader in a clear and compelling prose. Throughout the course and using textbooks, students will study useful writing points (writing clear sentences and coherent paragraphs, developing evidence, fundamental elements of style, etc. ).